Barroux was born in France. He studied graphic drawing at Maximilien Vox school, and attended the Boule School of Architecture for one year ; he also took lessons in graphics at the Estienne school in Paris. For ten years, he was artistic manager for various advertising agencies. Then he lived in Canada and the United States for a few years, and there started on an outstanding career in illustration for young readers and the press. He worked for several magazines like the New-York Times, the Washington Post, and Forbes and published several books for children, notably at Vicking Penguin Putnam Book publishers. In January 2003, he came back to France. Barroux has a traditional approach to illustration, mixing line engraving, black lead pencils, and acrylics. 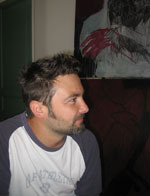 Barroux was awarded the ENFANTAISIE prize in 2005 for La cerise géante de Mr Jean Fantasy Price in 2005 by a jury entirely composed of young readers.